The first 100 active-duty US military servicemembers have arrived at the US-Mexico border as part of Operation Faithful Patriot, as a caravan of Central American migrants winds its way north through Mexico after having rejected Mexico's offer of "shelter, medical attention, schooling and jobs." The US troops are doing initial assessments of the border crossing at McAllen, Texas according to Fox News, while a Defense Department official told the network that there are around 2,600 troops at staging bases "largely in Texas," while several thousand more are anticipated to arrive this weekend to California and Arizona. 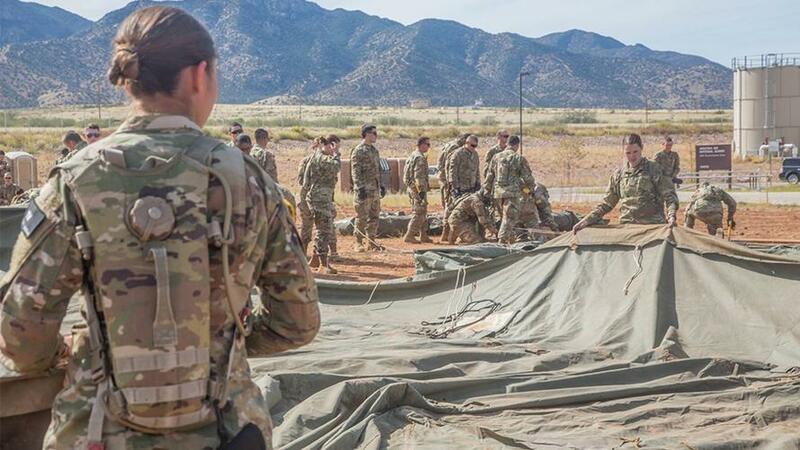 The Pentagon has said that over 7,000 US troops are being sent to the border, while President Trump said on Wednesday that the number could reach as high as 15,000. Trump has drawn a hard line on immigration just ahead of the midterm elections. Last week, officials indicated that 800 to 1,000 troops might be sent. On Monday, they announced that about 5,200 were being deployed. The next day, an Air Force general rejected a news report putting the figure at up to 14,000. The military operation is being headed up by Gen. Terrance O'Shaughnessy - head of the US Northern Command. He has argued that the caravan is a potential threat, though has not expanded on what he meant. "I think what we have seen is we’ve seen clearly an organization at a higher level than we’ve seen before," O’Shaughnessy said. "We’ve seen violence coming out of the caravan and we’ve seen as they’ve passed other international borders, we’ve seen them behave in a nature that has not been what we’ve seen in the past." On Thursday following reports that members of the caravan were throwing rocks at Mexican forces, President Trump said that the US military would treat anyone throwing rocks as if they were "rifles," implying that troops would fire on the caravan. On whether the military at southern border might fire on migrants, Pres Trump says "I hope not." Trump's comments come on the heels of several clips featuring violent migrants, including this one of rocks being thrown at Mexican security forces on the Guatemalan border. Trump promised an executive order sometime next week which would ban migrants from being able to claim asylum if they cross the US border illegally. He has also promised to set up vast tent cities "all over the place" in order to house caravan members, as opposed to the longstanding policy of "catch and release" by which asylum seekers are given court dates before they are set free.